RealityShifters | What Age Are We Living In, Anyway? What Age Are We Living In, Anyway? What do dreams, intuition, muscle testing, the placebo effect, spontaneous remissions, and synchronicity have in common? No need to think too hard; just go with what feels right. You won’t be graded on this, and in some parallel universe, whatever you select is sure to be correct. Most of all this quiz is just for fun! If you answered “D. Evidence of macroscopic quantum effects,” high five--you got it right! We are now entering a time of growing evidence of numerous quantum effects in daily life. While some visionaries are announcing we’re entering the Intuition Age, the Age of Synchronicity, the Placebo Age or the Age of Miracles, the point most people miss is that in the Quantum Age, all of the above experiences are increasingly commonplace. Furthermore not only are Intuition, Synchronicity, Placebo Effect and Spontaneous Healing equally intriguing and important, but each of these is recognizably different from the others, and each deserves recognition as being part of something even bigger going on. Which brings us to the meaning of the title of this post, What Age Are We Living In, Anyway? Many of our previous Great Ages (Stone Age, Bronze Age, Iron Age, Middle Age, Industrial Age, Information Age) began with a form of new technology whose advantages and memes worked their way into our language and way of thought. When many authors, visionaries and luminaries are asked why they think this is now the Placebo Age or the Intuition Age or the Age of Synchronicity, they often reply that it has a lot to do with our understanding of quantum physics... which indeed it does. As I enthused in September 2013, Welcome to the Quantum Age! While we will still use ideas and technologies from all previous great ages, such as stone, bronze, iron, telephones, computers and the internet, this new age promises to provide us with a basis by which we understand the connection between consciousness, the mind, the brain, and the universe. Even if you’re not familiar with the quantum phenomena mentioned on the left Micro side of the chart, you’ve likely noticed many of the items on the Macro side. 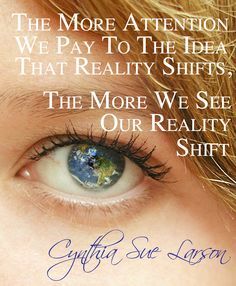 As RealityShifters surveys have reported twice in the past, more than 90% of people surveyed have experienced synchronicity, despite the newness of the word synchronicity, coined by psychologist Carl Jung in the 1950s. Intuition is a way of “just knowing” things without any rational explanation for how or why such knowledge can exist, and as a form of thinking, it’s been spoken and written about fairly often for hundreds of years. Cynthia Sue Larson provides a fascinating overview of the science and practice of Quantum Jumps for the Diablo chapter of the Institute of Noetic Sciences (IONS). Learn what it means to have entered the Quantum Age, and what you need to know in order to understand how quantum phenomena are no longer relegated to the realm of the very small. Discover how macroscopic quantum phenomena are being studied in wet, noisy environments such as photosynthesizing plants, and how scientists from an increasingly diverse body of interdisciplinary studies are finding ways you can benefit from making quantum jumps. 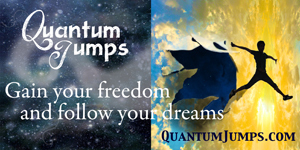 Near-death experiencer and clairvoyant Dawn Short interviews Cynthia Sue Larson, talking about her best-selling book, Quantum Jumps on a radio show guaranteed to expand your understanding of extraordinary experiences and expand your awareness of what's possible. 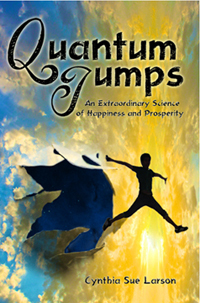 Dr. Irene Conlan interviews Cynthia Sue Larson about her best-selling book, Quantum Jumps, helping you find more happiness, contentment and success with some laughter along the way. Find out how you can take your life from ordinary to extraordinary in a laid back, informative and down to earth show you'll be talking about for weeks and months to come. Join Laura and Cynthia Sue Larson, best-selling author of Quantum Jumps on The Laura Longley Show as we discuss scientifically proven methods by which you can live a happier, more prosperous life... by jumping into parallel worlds. Get ready for a lively discussion that is guaranteed to open your mind to new possibilities, and provide you with exciting new ideas! Are we at the dawn of a new age of awareness — a “Quantum Age” when we begin to wake up and realize that we are not just our body or our situation, but instead are pure energy, pure consciousness inside a body? 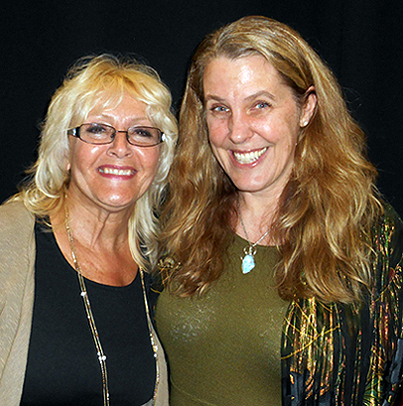 In this Wisdom Radio podcast interview, Andie Hight interviews Cynthia Sue Larson, who postulates that we are, and that we have the power to shift our realities. You will hear Cynthia talk about the science that indicates we all exist in an interconnected “holographic multiverse” in which we have the power to literally jump from one parallel universe to another with every choice we make. Did you know you can learn muscle testing in 3 minutes and get intuitive answers to any question? Muscle testing is a wonderfully simple technique that you can use just about anywhere you go to tap into intuitive information we all have access to. You might notice sometimes you have gut feelings about whether a choice you’re contemplating will work out well for you or not, and if you’d like to find a way to better hear that “still, small voice,” muscle testing is a wonderful thing you can learn to do in just a few minutes that can provide you with intuitive information very quickly in almost any situation, any time, anywhere. This type of muscle testing is a one-person technique that requires you have both hands free. You start by putting your fingers together so both hands are making little circles between thumbs and the pinky fingers. Muscle testing is useful for choosing things, when you want to know in advance before opening the package, is it good for you? Is this the right car to buy? and pretty much any other decision you need to make. It’s also helpful for finding people and things, and it’s helped me reunite with friends and family when we’ve become separated in crowds. I learned how to dowse in the town of Royston, England, where the curator of the museum showed me that I could find both the energy lines--the male and female energy lines under the museum called the Michael and Mary ley lines, and I could also refocus my attention and look for water, finding water under the cobblestones in the courtyard. It was really amazing to me because it works so easily. In just a few minutes, you can learn how to dowse with wire coat hangers. The first thing you will need is to get one one or two wire coat hangers. If you've got two wire coat hangers, this works a little bit better. 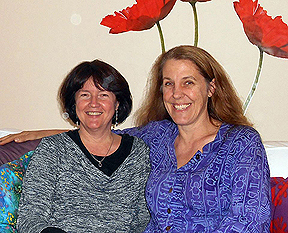 I really enjoyed the interview you recently had with Sandy Sedgbeer on Awakening Zone. It was so good to know that there are many others that have these odd experiences that often don't make much sense in the 3d world. Here is my experience: I was living in Boulder and had left early in the morning to drive to a beautiful, sacred site in the mountains near Lake Carter, to help friends erect and build a sweat lodge. This event happened on June 17, 2006. I was not drinking or in anyway influenced by any altering substances. While the men were assembling the Willow branches that had been harvested for the lodge, I was walking back down to a lower part of the mountain where we had our camp set up. It was simply the side of a beautiful mountain with just grass and flowers. As I took a step, right before my eyes was a door frame with an open door.... this was the most surreal experience I have ever had. I was aware and conscious of myself and my surroundings, yet I was looking at this open door with a frame around it. The door as I remember it sat about five feet in front of me. It was a framed wooden door and I believe it was white and had a white frame around it. It opened to the inside and the door opened to the left side. I am not recalling whether or not it had a door knob; I have never been aware of one. There was nothing attached to the frame on either side, or above. Instinctively, I knew that the door was an opportunity for me, but I do not know why or what it was about. I stopped and pondered what was taking place and simply by just knowing what to do.... I stepped through the door. It was a full sized standard, real door. When I walked through it I stepped over the threshold, just as you would with a real door. Once I stepped through the door, it was no longer there. There was no noticeable reality change of any kind. Someone else came from behind and was speaking to me; I asked them if they had seen the door - they replied, “No.” I did stay and finish the building of the lodge, have a wonderful Sweat Lodge experience and then had an amazing lunch. The experience has stayed with me ever since. From that moment forward, I knew I had experienced something very, very special. I wish I could better understand the significance of it and what may have been taking place. Clearly I was able to see into another higher dimension, but what was the meaning of the door? Note from Cynthia: Your experience of walking through that door sounds to me like it was intended to heighten your awareness to who you are and the truly amazing nature of reality. It does sound like it was some kind of portal. I get the sense while reading this that you noticed yourself feeling more keenly aware of everything after walking through the door, and perhaps noticed the world seemed different, or you were more aware of your surroundings. This sounds like the kind of experience you'd come back to and think about for years... and that it would inspire you to more deeply question who you are, and the nature of reality and consciousness. It happened again, Cynthia Sue Larson! I had listened to your latest interview this past week and wondered if I would have another quantum jump incident. This morning I was in the kitchen making coffee for my wife and I. I looked in the refrigerator for the coffee creamer and it was not in there. I went to the bedroom to tell my wife that we must have used it all. She said that we should still have some. I go back and look in the refrigerator and the coffee creamer was right there in front of me on the top shelf! I know that I could not have missed it the first time I looked. It's a really big bottle of caramel coffee creamer. Now that I've experienced this strange phenomenon 3 times, it really gives me hope for the future. Anything is possible! Note from Cynthia: Thanks so much for sharing this coffee creamer shift. I'm so glad you are noticing that the more you pay attention to reality shifts and quantum jumps, the more you experience them. And I agree with you that after witnessing several reality shifts, it's easy to feel optimistic and hopeful with a sense that anything is possible! Your videos and writings gave me a new and better insight into myself and the reality around me. A strange occurrence happened to me on 29th, June, 2013. I could have shifted into a parallel reality and was teleported from place to place. I live in a very small village in Kuala Klawang, which is located about 37 kilometers from the town of Seremban, the capital of the state of Negeri Sembilan, in Malaysia. Malaysia is the country north of Singapore. Seremban is a very small town according to International standards. Most of the roads in town are 2 lane traffic ( meaning up & down ) with the exception of the short 1km main road linking the town to the main Highway linking the Northern and Southern part of the country. I drive from my village to Seremban weekly to buy provisions and other essentials. I am very familiar with Seremban town and all the roads, housing estates, villages, and major buildings and structures within the vicinity of the town. I got up early (4am) on Saturday 29th June 2013, as I have to send my wife to Seremban town (37km) to catch a bus to Johore Bahru (304km). She was attending a class reunion dinner with her former class-mates in the evening in Johore Bahru. We planned to leave the house at 7am, giving her enough time to prepare her breakfast and also to give me enough time to update the computer software programs as we had decided to terminate the internet service on 29th June. We left the house on schedule. The drive to Seremban was uneventful. We arrived there at about 8+ am. I dropped her and her luggage at the Bus Terminal and told her that I might drive straight home as I did not have enough sleep the night before. As it was still early I thought of having my breakfast at the food-court opposite to the Seremban Lake Gardens before heading back home. So I headed towards the food-court which is situated in the centre of Seremban town. As I took a left turn from the main-road, I was surprised to see that the side road I was turning into is now wider ( the road used to be very small, 2 way traffic). The road was very much wider now with well marked traffic lines and parking bays. Suddenly a car came very fast towards me from the opposite direction. I was a bit annoyed, but I let it go & continued driving towards the food-court. As I turned in towards the food-court, I COULD NOT SEE ANY SIGN OF THE BUILDING. Instead there was a New Big Multi-level Building with a very nice Official gate (closed).The Building appears to be like a Government Official Building with Buntings and Banners. I was very surprised that EVERYTHING AROUND ME HAD CHANGED SO MUCH. I consoled myself by saying that I have stayed too long in my village that I am not aware of the changes in Seremban town. I decided to head back to my village in Klawang and have my break-fast or lunch there. As I tried to drive away I could not find the road that leads out towards the main road. I was really surprised. I had been in this area hundreds of times before. How is it that I cannot find my way out? Instead of heading out towards the main road, I was going through a housing area with very huge bungalows and mansions--something I had never seen before in place of the small single-story houses that are here now. There were familiar landmarks like the Seremban Lake Gardens. But the trees, landscape and amenities were different. The cars were all big and fast. New Big Buildings were everywhere in the town – not the old pre-war shop houses that are in existence now. Where is this place? Why am I not aware of this residential area? I was lost in the maze! Seremban is such a small town, and I thought I was very familiar with most of the roads and residential areas. Why am I am lost now? I finally gave up and asked for directions from an Indian man sitting in front of his house. Following his directions, I found my way out of the maze. This time I came out into the Main Road besides the Seremban Lake Gardens. I thought I was alright. I saw groups of people exercising/walking/running in the gardens. I was having a stomach upset. I need to find a public toilet. I could not see any toilet in the Gardens. This time I was out in the busy highway traffic, and unfamiliar with this road. I cannot find my way back to Klawang. What is happening to me? Everything is so different! The landscape is different. I am driving down a 6 lane highway with 3 lanes on either side. Most of the roads in Seremban town are 2 lane roads. The roads I was traveling in are 6 lane highways (with the exception of the mountain and village roads) with cars traveling at speed like the German super-highways. I could not recall seeing any vintage cars. Most of the cars appear to be modern and were zooming so fast. There is a Petronas and a BHP petrol station on the opposite side of the highway. I must find a U-Turn. I drove down the highway and found a U–Turn. I made a turn, and am now heading in the opposite direction. I passed the BHP gas station. I decided to take the Petronas gas station – the toilets there are normally cleaner. I parked my car and headed for the toilet. As I guessed, the toilet is very clean. What a relief! I remember looking at my car when I stopped at the Petronas gas station. It was the same small blue car that I am driving now. I cannot recall the type or color of the shirt I was using then. After that, I headed to the main office/cashier to ask for directions back to Klawang. The Manager was there. A guy with the typical Muslim “goatee” and mustache. He gave me the directions. Take the Highway, make a U-Turn, go down the opposite direction, stop at the traffic light, turn right. Go all the way down until you meet a T-Junction. Take the side slip-road before the junction, drive up the road, over the fly-over and you will be heading towards Klawang. He gave me a sly, cynical smile as I thanked him. I was wondering why did he smile that way? Is he up to mischief? I should not be bothered about silly things! I headed out of the station into the Main road. The traffic was very, very heavy. Everyone was driving at break-neck speed. No one wants to give way. I must be careful. I inched the car out. I followed the gas station manager’s instructions to the letter. Why am I not heading back to Klawang? I am lost again! This time I am driving up a mountainous roads. I am not familiar with this place at all. I passed by so many villages that I am not familiar with. Where am I? I passed by schools, “madrasah” (religious schools), and community centres. The roads are now narrow village roads with thick vegetation on either sides. The roads are either going up steep hills or down steep hills. Along the way I passed by a few village houses. I came into a small Chinese village. The houses are all very small and dilapidated. Is this a dead end road? Ha! There is a perfectly mint condition Mini-Cooper ( Complete with the British Flag painted on the rooftop) parked in the front part of one of the run-down houses. I was telling myself that one car can buy most of these run-down huts. Why does a person who can afford to buy such a nice car stay in such a tumbled-down house? Aha! There is a small metaled road leading down from this place. As I headed towards it, a big MPV came charging up the narrow lane. (Driven by a Fat, Ugly & Mean Looking Chinese girl.) Why do these people drive so recklessly? Another MPV came charging up the narrow lane. A Chinese guy came out from the house with the Mini-Cooper. He is glaring at me. This place looks like a “ Chinese Triad” territory. I should get away from this place as soon as possible. I left the Chinese village. Along the way I stopped by a Mosque, located next to a “Madrasah” - Muslim religious school. I wanted to use the wash-room. The main gate was closed. There was a SIGN which reads “ PLEASE CLOSE AFTER USE”. I was amused. How comes the sign-board at a Muslim Mosque in Negeri Sembilan is in ENGLISH – not in Malay or Arabic!! Finally I managed to get out of the hilly and mountainous areas. I came across a small cluster of nice terraced shop-houses. There was a sign board with the village’s name. I cannot remember the name now. I passed by a shop with a sign which reads “NASI LEMAK” – meaning rice cooked in coconut milk. I was really hungry. So I decided to stop and try the “nasi lemak”. I parked the car on the opposite of the road, a few shops away from the “NASI LEMAK” shop. The shop is very popular – almost a full house. I managed to get a table. Opposite to me is a table with 3 occupants. A bald middle aged man was SQUATTING on the chair. Next to him is an old man who resembles him greatly – could be his father. The old man is pretty ugly – wearing a skullcap and breathing through an inhaler. The third person is a GLUM looking woman. She could be his wife. She keeps on putting things she does not want to eat into the man’s plate. The table on my right side was occupied by 3 women. One an old woman with a grizzled face. Sitting opposite to her is a very fat woman. She looks like one of the Malay actress. Next to her is a fat Indian lady with a pony-tail. They were all talking noisily. The table behind me was occupied by a couple with their children. I cannot recall the others in the shop. The shop owner is a stout fair-skinned man with pronounced facial features. There were 2 shop assistants and 1 woman helper. In Malaysia, we have a good mix of people/races - Chinese/ Indians/Eurasian/Malays and a whole range of Native indigenous people. Each race is further broken down into clans and dialects (spoken language). For example, the Malays speak 12 or 13 dialects. It is quite easy for us to detect the spoken dialect to know which part of the country a person comes from. In this instance, the people in the restaurant spoke the local Negeri dialect.They did not really "speak" - (there was a lot of noise in the restaurant) - my subconscious mind senses that particular dialect was being spoken and that I have seen/met these people in my real physical existence. I did not really “talked verbally”. It is more intuitive – like we were connected on a subconscious level. I knew instantaneously what people were trying to communicate to me. It is like telepathic communication. That is the best way to describe it. The feeling is like recognizing the "consciousness" within each each individual - NOT the face and physical appearance. The “nasi lemak” sold here is unique. It is served like a buffet lunch. Lots of curry dishes to choose from. The basic “nasi lemak” comes with a slice of egg + anchovies + cucumber + Hot or Sweet Chilly sauce. I chose “Nasi Lemak” + 1 fried egg + Hot chilly sauce + “rendang”curry + 1 fried fish + plain water. ( Cost $5.20). Later I had 2 packets Sweet Fermented Rice ($2.00). The food was really tasty. I have never tasted “nasi lemak” and sauces like that. THE STRANGE AND SCARY PART ABOUT THIS EPISODE IS THAT ALTHOUGH I HAVE NEVER HEARD OFF OR BEEN TO THIS PLACE BEFORE – I SEEM TO RECOGNIZE OR KNOW MOST OF THE PEOPLE IN THE SHOP. THE SECOND SCARY PART IS THAT WHILE I WAS HAVING MY LUNCH, I WAS SLIPPING FROM ONE LIFE CYCLE TO ANOTHER TO ANOTHER. I ACCEPTED IT AS A MATTER OF FACT. I WAS NOT AFRAID. After lunch, I asked the shop assistants for directions back to Klawang. One does not know the way. The other one gave me the directions. He reminded me not to take the flyover but go under-neath the flyover and turn left to get back to Klawang. It was a long journey back – over hills and mountains. Finally I reached the flyover. I turned left and found my way back towards Klawang. In reality there has never been a flyover between Klawang and Seremban. AS I DROVE, I KEPT ON SLIPPING FROM MY MEMORIES OF VARIOUS SITUATIONS IN ONE LIFE CYCLE TO ANOTHER. I drove along this road, passed residential schools, towns, villages until I reached the new housing project near Pantai town. As I was turning left at the junction at Pantai village towards Klawang, I was suddenly TRANSPORTED away from Pantai village junction to the junction at Lenggeng village (About 10 kilometers away). I materialised with my car at Lenggeng Junction. I was turning left into the Main road leading to Klawang. Suddenly a lorry laden with chicken came charging along the main road from the right side towards my car. I had to quickly swerve my car into the road kerb to avoid being hit. Then another huge Monster lorry came charging from the left. I was lucky that it missed my car. The trip back was uneventful EXCEPT THAT THE SCENERY & VEGETATION ALL ALONG THE WAY from Lenggeng to Klawang took on a MAGICAL LUMINUOUS SHEEN like what you see in fairy tales and kid’s movies. The roads are wider and different. The plants, trees and foliage are so vibrant, full of life & radiant. I feel that they are communicating with me. Upon reflection, the most striking thing about my experience, are the plants and trees all along the way. They seem to be able to communicate to each other and to project a kind of warm and happy feelings to me. They are all aglow with a beautiful luminous velvety sheen - like the beautiful emerald-like the plumage of the beautiful male humming bird. The other thing that I forgot to mention, is the vibration in the air - as if the air was alive and giving out this happy and joyous vibrations. There was a humming sound in the air. It is the same kind of feelings that you feel if you are meditating near the magnetic vortices in Hawaii or up in the highlands in Sedona. All along the way there were changes. New houses appeared where there is none now. Some of the existing houses had disappeared. Some shacks along the road were replaced by proper houses. It was like that all along the way. Even my nearest neighbours houses looked different. I finally reached home. I parked my car in front of my house. I looked at the time. It was almost 1PM. I had dropped my wife earlier at the Bus Terminal in Seremban at 8+AM. WHERE WAS I FOR THE LAST 5 HOURS? I was taken on a ride to places and villages that DOES NOT EXIST NOW. As I sat in the house, I tried to recall all my thoughts & feelings. What is really happening to me. I pinched myself to confirm that I am alive – NOT A SPIRIT WHO IS HANGING ON TO LIFE AFTER DEATH. In the evening I really worked hard in my garden to feel life. I did a lot of heavy stuff. I felt good then. I AM ALIVE – NOT A GHOST or SPIRIT. I had dinner later in town. So, I am okay. After the experience, I tried to retrace my movements in my " teleportation" journey, but I could not find most of the places that I had visited. I AM NOT A VERY SPIRITUAL PERSON. MANY YEARS BACK, IN THE 70’s /80’s, I HAD READ SOME THEORIES ON TIME AND REINCARNATION. THERE WAS A BELIEF THEN THAT TIME IS NOT LINEAR AND SEQUENTIAL IN NATURE. THERE WAS A BELIEF AMONGST THE THINKERS OF THE DAY THAT TIME IS LIKE A DOT IN THE CENTRE OF A CIRCLE, WITH SPOKES RADIATING OUT FROM THE DOT IN THE CENTRE OUTWARDLY TOWARDS THE CIRCUMFERENCE. MEANING THAT SPIRIT CAN MANIFESTS ITSELF FROM THE CENTRE OUTWARDS INTO MANY EXPERIENTIAL LIVES INSTANTANEOUSLY AND SIMULTANEOUSLY CONTRARY TO THE BELIEF OF THE REINCARNATIONISTS THAT ONE INCARNATES FROM ONE EXISTENCE TO ANOTHER IN A LINEAR FASHION. I am glad that I came across your website on parallel realities and teleportation. I belief that my experience in the TWI-LIGHT ZONE, for 5 hours on Saturday, 29th June, 2013 was an experience in PARALLEL REALITIES & TELEPORTATION. In my early years in the 1970’s and 1980’s I read channeling by various entities like, Seth, RA, Ramtha & St. Germaine. I heard of channeling by an entity called Basha, but I did not really go in depth on their talks on PERCEPTION OF REALITY. I was not ready then to go to such altered states of consciousness. In the 70’s & 80’s I may have been too caught up in my material worldly existence so I was not ready then to jump into different dimensions of knowledge & reality. After my experience on the 29th, I decided to look up for articles on channeling, to learn and understand more about PARALLEL REALITIES AND TELEPORTATION. I searched the net, and was lucky enough to find a series of YouTube downloads on the subject which were a fantastic eye-opener for me. I can now understand in a small way the FANTASTIC capabilities of our physical & higher consciousness, not to mention our relationship with the SUPREME CONSCIOUSNESS/REALITY. I can now know & understand the Purpose of our Earthly Experience & the Joy that I seek in this present existence. I know now that everything that has happened to me in the past and present is the result of my conscious and unconscious choices & desires. There is NO ONE TO BE BLAMED for the pain, sadness, failure and sufferings that I have experienced in my life. I AM RESPONSIBLE for all that has happened in my entire existence. The HAPPINESS & JOY that I have experienced are also the result of my own doing. I can now see, feel and understand the RELATIONSHIP between my experiences, thoughts and actions that has created my experience of the WORLD around me. I am really happy and grateful that I have come across this wonderful knowledge, awareness and insight. I know that I am fully capable of charting a new course in my life, which will result in much JOY, HAPPINESS & FRUSTRATION OF ALL MY DREAMS AND DESIRES. Note from Cynthia: Thank you so very much for sharing your most wondrous experiences of extraordinary travels for five hours to villages and places that don't currently exist! I am especially intrigued by the way certain places and people seemed so very familiar to you, as if you knew them very well, and also how you drove under a flyover between Klawang and Seremban that does not currently exist... and also how you were suddenly teleported with your car a distance about 10 kilometers from Pantai village junction to Lenggeng junction--Wow! 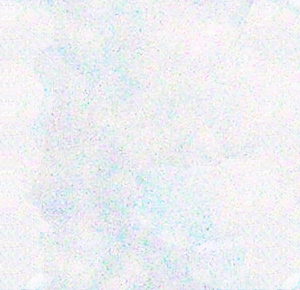 I have heard reliable reports from several people who've undergone similar walks through parallel universes and teleported, and based on my own personal experiences of witnessing quantum-type effects on a macroscopic scale, I've come to view reality as being a holographic multiverse in which we are not our physical bodies, per se, but actually are consciousness, and being consciousness we can (and often do) experience quantum effects such as teleportation, superposition of states, and entanglement in the macroscopic world. Put another way, we can expect to sometimes experience teleportation and parallel realities, as I write about in my book, Quantum Jumps. I was googling for 'changing the past' and found your site. I had a little question.. What if something painful has happened, which really nobody had wished for, in a moment of not paying attention and someone got hurt. Although things are forgiven, still the past seems to chase the present by people gossiping, saying not nice things and feeling so sorry for everything. Shifting to another reality where none of this happened seems so hopeful, but can I literally get there? Like waking up and it all seemed like a nightmare.. I don't want to leave anyone on the other hand. But i would love to see things so different, it's just not easy.. Sorry for writing you this mail, but thank you so much for a little time! I send you so much love! I've received many queries similar to yours over the years, in which people wonder whether it's likely or possible to change a specific past. My answer is that while it's not likely, it is possible. What I've heard from a very select few who have achieved this is that the supposedly "better" reality that is now lacking the regrettable incident is actually not that much better, but instead other things seem wrong, unpleasant or "off." I thus recommend to utilize a more open-ended positive intention to experience the best for all concerned, rather than intend to experience a specific particular improvement which may not be an overall optimization. In other words, I recommend feeling as much gratitude for the past as possible, finding rainbows in the rear view mirror of life every time you look back and see thunder clouds, lightning and rain. Doing such a simple thing as entangling yourself with positive elements from your past helps ensure the very qualities of life you most savor and hold dear will stay with you and assist you in arriving in positive realities in the future. I had a question. I am not sure if this is in your books or not but I have been practicing Neville's success steps in visualizing the fulfillment of my desire as if it's already happen so that I can change my reality. And then just living in that reality. How do you know when your reality begins to change? How can you tell? I would like for my ex and I to get back together, so I am envisioning a reality based on that. Thanks so much for writing to me with this question about how to tell when your reality begins to change. The best way I can describe it is that when you're properly aligned with your best possible future self, it's like you can feel yourself being either on or off-track, just as you can have a feeling if you oversleep that you need to wake up, and the same way you can tell you need to stop eating a wonderful meal because you're full. What I am attempting to describe to you is a kind of knowingness... such that when you are really on track with living your best possible life, getting on track with that by thinking, feeling, doing and being exactly your very own personal favorite version of yourself feels amazingly wonderful! If you are not feeling anything like what I am describing, then perhaps what you are visualizing currently is not something that truly galvanizes you into action in ways that make you feel energized, enthused, optimistic, fulfilled, and vibrant in every cell and fiber of your being. If this is the case, I'd suggest opening up your visualization with the question, "How good can my life get?" in order to receive additional inspiration and fresh, creative ideas. Chances are that any current lack of excitement and enthusiasm is directly linked to your being presently off-course from the most direct trajectory to becoming your favorite best possible future self. I may be doing this when I sleep? Unknowingly and unwillingly. I wish I could have more control of such jumping. I stumbled across you and this because of a dream I had that actually involved being someone else and his experience of quantum time jumping. This concept is super confusing to me as I have never heard this prior to about 2 days ago. I often dream of being someone else never the same person but often military people (men) as I am a 95lb girl in Kansas no military experience... I find this extremely strange. Thoughts? Can you accidentally do this in your sleep? I am a open individual but I don't go looking for this kind of info I receive until after I dream. I also suffer from horrendous nerve headaches anyone else experience those symptoms? I recently had a horrendous head episode and that night I dreamed of being someone else. I just realized this so it's too soon to make a correlation to the headache and the dreaming. I suffer constant nerve headaches just sometimes they are debilitating.. Just questions.. I don't think Im special or anything it's just so very strange and the confusion is leading me to reach out. Thanks so much for writing to me and letting me know that you'd love to know what's happening when you have dreams of being someone else--particularly military men, living lives very different from your own. To answer your question, yes, you absolutely can experience the lives of others unintentionally while you sleep, through dreams. Once you've ruled out other possible explanations such as dreaming about movies you've just watched or books you've just read, explanations of quantum jumps into other parallel universes / lives is a good one. Headaches are not necessary to make quantum jumps, and I haven't heard of people who make quantum jumps experiencing headaches. It's my belief that quantum jumps are something we are doing all the time, and strange as they may seem, they are not a sign of "super powers," but rather an indication of our true identity being consciousness, rather than any given physical body. I don't know if you have a lot of time to read these kind of mails or answer them, but I've been having a few issues and I though I'd contact someone who knows more about it and could maybe help me. I'll start with some background information. I'm a 23 year old female, living in Belgium, together with my boyfriend who is 25. We've been together for only 1 year but it feels like a lot longer. When we met each other it seemed like we already had a very intense bond, and knew each other even though we hadn't seen each other before. We both believe we are what some people call twin souls, we have a very deep connection that I never experienced with someone else. Since the beginning of our relationship it felt like a part of us was missing when we weren't with each other and it still feels that way. Now a couple of weeks ago I started feeling like I was missing something, or some part. We were talking about our lives and how they were before we met each other. I realized it felt like I was missing a part of him that I never knew, the person that he was before he met me, it wasn't just a feeling like "gosh I wish I would've known you back then" it's actually more like "I miss it even though I never knew it and can never get it back". At some point I was talking about it to him, about what would've happened if we met each other a lot earlier on, and I started getting flashes, like little scenes of memories of what would've happened if we did meet a few years ago. The strange thing was, it didn't feel like something made up or a creation of the mind, it felt like a memory. The funny thing is that if I made one choice differently in my life I would've actually met him at that time. After that I was very intrigued and I felt like I really had to feel and experience this, I wanted more than just these strange and vague memories who weren't actually my memories. I felt like I wouldn't see and feel them if they weren't real. The next day I started researching, without knowing what I was actually looking for, I ended up on quantum jumping. I was the closest definition or explanation to what I seeing. After that I tried out some meditation exercises in which I tried to channel in that memory/alternative path. I also made my boyfriend try these exercises. We both saw very intense things, things that awakened these intense feelings of love, like we just met each other again. The thing is, at this is probably the part where I'm going to start to sound insane, we both feel like it's not enough to just experience and feel this through meditation. We both want to live it. We both realize that if we met sooner we would've had a much happier life and we would stand so much further in life, it feels like I made the wrong choice, by not enrolling in the school he was in at the time I could have avoided all these wrong choices that followed that decision. My question is the following, is it in any way possible to get back to that path, to make a different decision? Doing more than just visiting and watching from a distance? I'm sorry in advance if this seems like a very crazy question, it just feels like it was really meant to be that way. I attended your workshop in San Jose a couple of weeks ago and already feel more upbeat even though am just doing a morning affirmation and sporadic visualization. I'm learning basic self-hypnosis. Is it possible to use any kind of affirmation to help the reality shifting process? Really looking forward to your reply. Thanks so much for letting me know you're feeling more upbeat after attending my Quantum Jumps workshop and doing morning affirmations and occasional visualizations! Yes, it is possible to utilize affirmations to assist yourself in reality shifting, and you can create individualized affirmations that are optimally suited for your own unique needs. The process of creating individual affirmations is described in my book, Reality Shifts, in a chapter that includes illustrations showing how energy from constructive and destructive interference can serve to help or hinder us when we are shifting reality and jumping from one reality to another. As you meditate regularly, and your mind quiets, you can more easily hear internal self-talk that may be overly self-critical, which you can then address by creating customized affirmations designed to exactly address each of those particular issues. A fast, fun and easy affirmation that works as a kind of "super-affirmation" is the simple question, "How good can it get?!" which asked often enough and with genuine feeling, can completely improve your life in every imaginable way. PSI WARS tells the true story of what happened when Rupert Sheldrake and Graham Hancock were summarily banned from inclusion in an upcoming TEDx talk due to unspecified anonymous complaints, and the subsequent warfare that transpired on Wikipedia pages and behind the scenes at TED. One might presume that on a free internet, ideas from all branches of science are being fairly heard, yet such a naive assumption turns out to be completely wrong. We're alive at an extraordinary time in history, as the long-held material paradigm begins to crumble in the face of a new quantum paradigm and the Information Age slowly but surely gives way to the dawning of a new Quantum Age. Author Craig Weiler shares reports from the front-lines between self-appointed guardians of material realism and authors and experts expressing new ideas. With juicy excerpts from emails and internet posts in the sequence in which they occurred, Weiler's book describes the behind-the-scenes shenanigans as they played out between zealous guardians of material realism and scientists and experts in the field of psi. As it turns out, Wikipedia pages are not created by experts, nor is the information carefully updated from source documents, nor are Wikipedia editors required to learn effective ways to negotiate without resorting to personal attacks. As a writer who has written and edited Wikipedia articles, I have gone on record as finding edit/revert wars disruptive, and voiced support for requiring registration for editing articles, and improving policies reducing and preventing personal attacks. I am keenly aware that most people have absolutely no idea how incomplete and slanted many Wikipedia pages have become, due to self-appointed page squatters... but Weiler's book gets straight to heart of this debacle, illustrating some truly horrific misuses of Wikipedia editorial power. Perhaps even more disheartening is the real-life account of just what went wrong when TED chose to buckle to public pressure from a vocal minority, rather than standing up for the goal of "ideas worth spreading" they purport to support. If TED sought to avert controversy, they made a muddle of it, and if they thought they were leaning toward the side destined to eventually "win," they made a mess of that, too. While the recent events described in PSI WARS do not paint a pretty picture, it does show us a true image of just what people look like when paradigms begin to fall. As physicist Max Planck once said, "A new scientific truth does not triumph by convincing its opponents and making them see the light, but rather because its opponents eventually die, and a new generation grows up that is familiar with it." The scientific truth Planck was referring to has to do with understanding the new quantum paradigm, which is slowly but surely assuming its place and introducing consciousness as it does so to all branches of science, from astronomy to biology, chemistry and statistics. Highly recommended! As a fellow author who writes in the "science help" category, I appreciate DiSalvo's practical approach to sharing insights from some of the most recent findings from neurological and cognitive science. DiSalvo's background as a science writer with lots of curiosity makes him a trusty guide starting out in more familiar territories of behavior, feedback loops, personality categories and subconscious thoughts... and moving into less familiar landscapes of a variety of new ways you can exercise metacognition and do a better job of thinking about thinking. The big idea behind BRAIN CHANGER is that your brain--and your thinking--is not as static or fixed as most of us assume, and with small, steady modifications, you can boost your brain efficacy, health, and enjoyment in life. Feeling distracted or unmotivated? Swish a sip of sugary drink around in your mouth for a second, and enjoy a tremendous charge of energy and focus. Want to change a habit? Learn to change your routine. Feeling exhausted from lack of sleep? Review six things known to improve your odds of getting at least six hours of sleep a night that in turn will help ensure your cognitive powers are at their best the following day. BRAIN CHANGER is an excellent book for people interested in coming up the learning curve of what we now know to be true about how we think, and how thinking about thinking can greatly improve our lives. This is the kind of information all elementary school kids need, so we can dramatically improve society, so I highly recommend it for all parents and educators.